If you’re in a hurry to restore your wood flooring and don’t want to deal with the sanding process, we offer a highly effective sand less wood floor restoration service. If the finish on your wood floor is dull and lackluster or has light scratches, we can make it look like new again without all of the labor and mess of sanding, staining, and refinishing your floors. We will first need to assess your flooring to determine if it is a good candidate for our sandless wood floor refinishing process, then we will use our state of the art equipment to clean the floors to remove all embedded dirt and grime from the wood. ​ We then use a special liquid that roughs up the old finish in order for the new finish to bond to it. The added coat of new finish will extend the life of your flooring and last a long time, unlike wax or other products that people use to try to improve their flooring. Now, this method almost sounds too good to be true, and you’re probably wondering why people even choose the sanding and refinishing method if this technique works without all of the labor and hassle of sanding. In reality, this process should only be used on hardwood flooring that has very light damage. It will make some floors look amazing, but other floors not so amazing. Typical wear and tear and very shallow scratches in the polyurethane finish will disappear with the sand-less refinishing technique. In areas of heavy traffic where the finish is flaking or completely worn away, sand-less refinishing should not be used. The chemicals we use do not remove water stains and can damage the bare wood. If your floor has a wax finish on it, a new finish will not stick to the wax and sanding needs to be done before applying a new finish. Let Sandy Springs Hardwood Flooring determine if your floors are a good candidate for our revolutionary sand-less wood floor refinishing process. 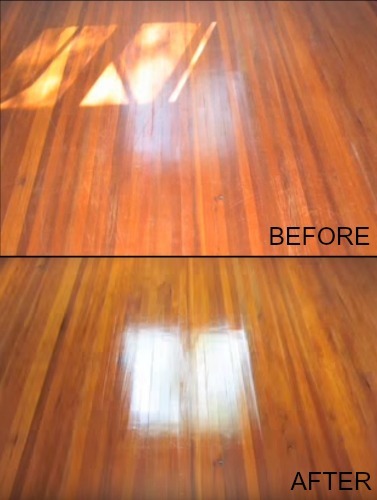 Whether we perform sand-less refinishing, or we go the traditional route of sanding, staining, and finishing your floors, you can rest assured knowing that we do the best job possible, every time. Your flooring will be so shiny and sparkly, you’ll think we went behind your back and installed all new flooring. Our expert flooring contractors take pride in their work and will treat your home as if it were their own. Let Sandy Springs Hardwood Flooring show you why we are considered the best wood flooring company in the area with our exceptional refinishing services. 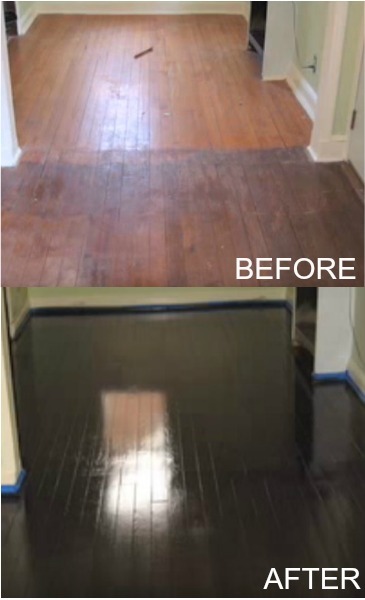 Don’t replace your existing floors just because you’re embarrassed by how worn and damaged they look; let us refinish them and save you tons of money in the process! Call us now at (404) 341-7071 !